After studying Fine Art at Reading University, Isobel continued to paint and exhibit for a few years. She then channelled her creativity in a different direction when her family were young and re-trained as a garden designer, happily combining her two passions, painting and gardening. Isobel ran her successful garden design and construction business for 20 years. Her designs were works of art in their own right and the process and requirements of creating a beautiful garden were not dissimilar to painting a canvas. 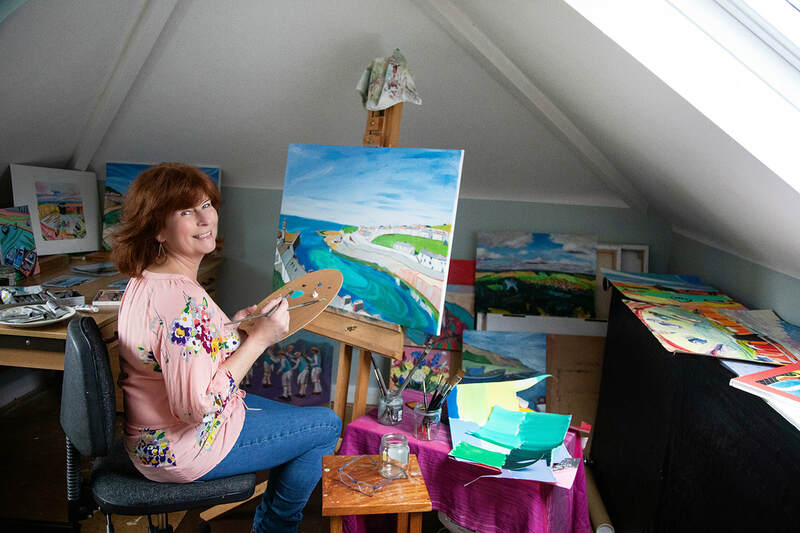 Isobel has now returned to her painting full time and is rediscovering herself as an artist. Early inspiration came from village life and the surrounding countryside of West Berkshire where she lives. The Morris Men dancing at the local pub, the rolling hills and big skies of the local downland landscape. More recently she has been painting harbour scenes in Cornwall. In particular, the shapes and patterns created by the harbour walls and boats moored at Mousehole and Porthleven. Colour is her passion. She works in different media, including oil, acrylic, watercolour, pastel and paper cut-outs. She approaches her work with instinct and ‘gut reaction’ and finds creating a piece of art a very physical and emotional experience. Her work is bold and expressive.